Just before the first panel of Fainting Robin Foundation’s Cambodian and Vietnamese highlander conference began, decorated Green Beret Ron Copley rose and addressed the Montagnards who had traveled from different parts of North Carolina to attend the event. Copley thanked them for their loyalty to U.S. Special Forces during the Vietnam War and added that he would probably not be alive without them. 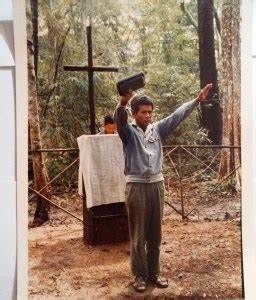 Some in the audience, like Y Siu Hlong and Y Duen Buondap, were once soldiers of the United Front for the Struggle of Oppressed Races, better known as FULRO, a Montagnard resistance movement that sought autonomy from Vietnam. FULRO as well as Montagnards trained by US Special Forces as Civilian Irregular Defense Forces (CIDG) began fighting the Vietnamese during the early 1960s. By the time the U.S. withdrew from Southeast Asia in 1975, 85 percent of Montagnard villages had been destroyed and half of their adult males were dead. FULRO’s remaining 10,000 soldiers continued to fight the Vietnamese after the U.S. withdrawal. Even though 8,000 of their men had been captured or killed by 1979, they launched attacks against the Vietnam troops into the early 1990s. Y Siu Hlong and Y Duen Buondap both thanked the Green Beret for his heartfelt words and told him that they did not blame him for the political decisions that set their people’s tragedy into motion. After this public act of contrition and forgiveness, it was clear to everyone assembled at UNCW’s Warrick Hall that this would not be a typical academic conference. Few know that today North Carolina boasts the largest population of indigenous highlanders from Vietnam and Cambodia outside of Southeast Asia. Commonly and collectively referred to as “Montagnards,” they number more than one million people in Cambodia and Vietnam and come from more than thirty distinct ethnicities, including Jarai, Ede (Rhade), Bahnar, Bunong, Stieng, Koho, Lach, Sedang, Raglai, Hre, and Bru. In Vietnam, Montagnards were also America’s most valiant allies during the Vietnam War. “We fought alongside them from 1962 until 1973. We loved them. They were a sturdy reliable people. They were brave, and many of them saved many of our lives,” wrote retired Green Beret Jim Morris. When Thayer found the last FULRO faction deep in the Mondulkiri forest in 1992, he was the first white man they had seen in 17 years. The first thing they asked the reporter, in English no less, was if he had orders or knew the whereabouts of their leader Y Bham Enoul. When Thayer informed them that he had been executed by the Khmer Rouge in 1975, some wept while others refused to believe him. One of the FULRO leaders asked for three things: proof Y Bham Enoul was dead, the arms the Americans had promised 17 years earlier, and a meeting with the American ambassador. “I have a plan for the future, and they should know clearly our position for the revolutionary struggle,” he said. “We want to know whether they will help us or not. The Americans had a whole plan for Indochina.” Before the 398 FULRO soldiers and their families boarded the Russian helicopters that would take them on the first leg of their journey to America, they surrendered 194 old but perfectly maintained weapons, 2,567 rounds of ammunition, and a single M-79 grenade launcher with one round. The next waves of refugees came to North Carolina after Montagnards held protests in Vietnam’s Central Highlands in 2001, 2004, and 2008 calling for religious freedom, land rights, and an end to ethnic discrimination. When the Vietnamese government responded with force, thousands of highlander families fled on foot for the forests of Cambodia’s Mondulkiri and Ratankiri provinces. 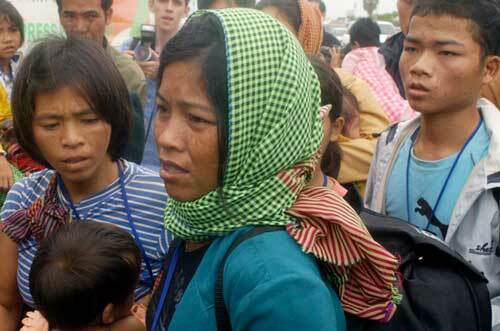 Even though the Montagnards met the terms of the United Nation’s 1951 convention on refugees (any person with a well founded fear of being persecuted for race, religion, nationality, social group or political opinion), the Cambodian government forcibly returned many of them to Vietnam. Once again, the unlikely alliance of Vietnam veterans, human rights officials, missionaries, reporters, and US government officials reactivated their underground railroad to get the highlanders from Cambodia and to North Carolina. 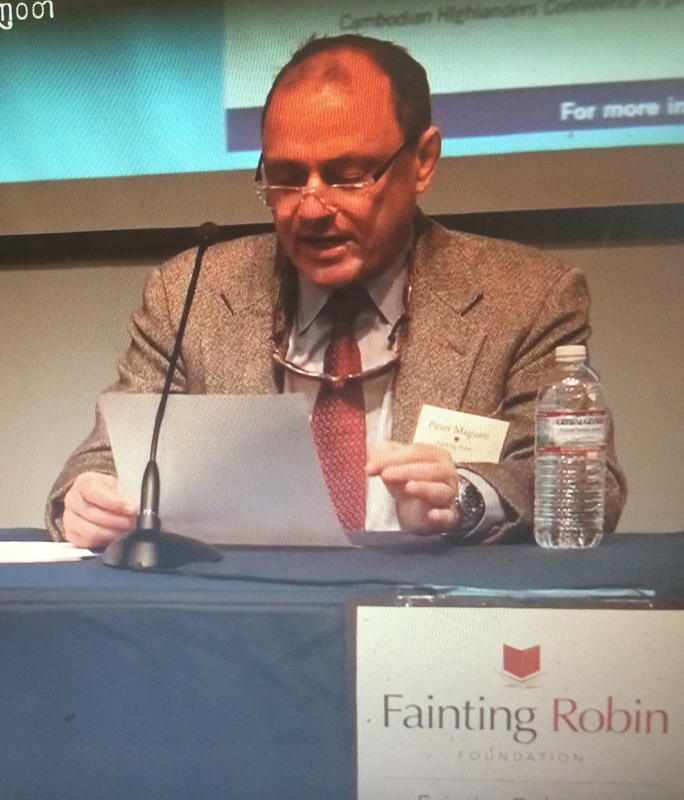 Sylvain Vogel, Fainting Robin Foundation’s 2017 Distinguished Scholar, opened the Cambodian and Vietnamese highlander conference by comparing the highlanders’ vast body of oral literature, once passed down from generation to generation, to Homer’s Odyssey. Vogel believes that the stories are attempts to explain social facts that present anomalies to their society. 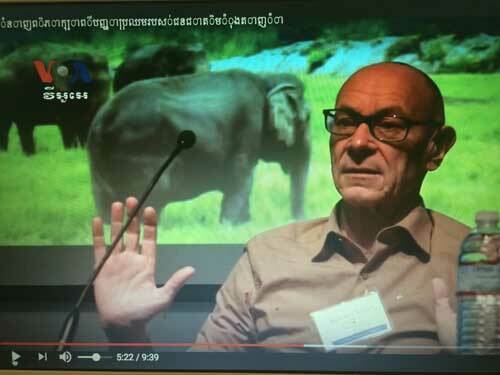 Vogel, whose work focuses on the Bunong ethnic group, told one of their tales, “The Children Who Were Changed Into Elephants.” In it, two boys senselessly kill one of the god’s water buffalo with their new crossbows and are punished by being transformed into elephants. The moral of the story, don’t kill for the sake of killing, is an idea that is repugnant to the Bunong, renowned for their skills in capturing and raising wild elephants. Vogel has no illusions about the future of the Bunong and other highland groups, and believes that their cultures are on the brink of extinction. That is why the linguist has spent the last 25 years documenting their language and folklore on his own time and at his own expense. “I offer no solutions. No wishful thinking, no politically correct language, and no bleeding hearts can change a thing,” he explained. “I am only a witness who has watched, with great sadness and a feeling of helplessness, the disappearance of a culture.” The linguist concluded his talk by pointing out that although the highlanders survived decades of war, globalism has proved to be their most daunting foe. Huge old-growth forests of mahogany, rosewood and other tropical hardwoods, once their home and means of sustaining their traditional way of life, are now some of Southeast Asia’s most valuable exports. 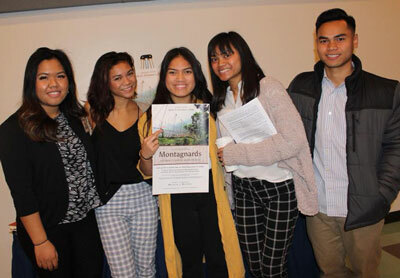 One point of hope, however, were the many connections Vogel made with members of the Bunong community in North Carolina, as well as historians and linguists here, with whom he hopes to collaborate in future projects of cultural and linguistic preservation. Copley told a story about preparing for a night time attack. That night, Crile and Copley slept on opposite sides of a large tree with their M16 in their laps. Each man slept for an hour while the other kept watch for an hour. The two Special Forces men later learned that their two Montagnard bodyguards had also stayed awake all night to make sure the two Americans were not harmed. Copley thanked the Montagnards not just for that night, but for all the days and nights the Montagnards protected US Special Forces men. Ron Copley readily admitted that he would not be alive today if it were not for his Montagnard allies. The day’s final panel on resettlement of Montagnard refugees in the US was moderated by Sara Colm, who played an important and unsung role in getting the highlanders refugee status and asylum in the U.S. while serving as Human Rights Watch senior researcher in Cambodia (1998-2011). Colm reminded the audience that even today, Montagnard groups in the Central Highlands are being imprisoned, tortured, and prevented from practicing their religion freely. 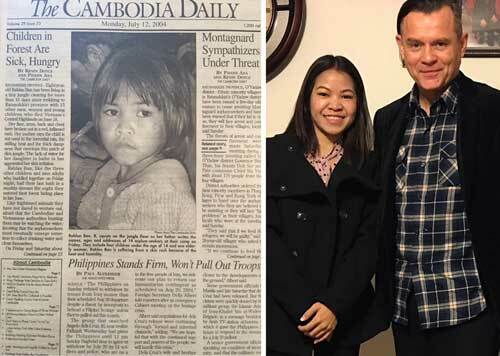 The panel saw former Cambodia Daily editor Kevin Doyle reunited with Jarai-American refugee Ladhan Rahlan after an eighteen year separation. A photograph taken by Doyle of Ladhan as a malnourished five-year-old hiding with her family in the forest in Cambodia was featured on the cover of the Daily in 2004. It sparked an international outcry that led to the United Nations taking Ladan and hundreds of other Montagnards to Phnom Penh, where they were eventually resettled to the US. Today the small, malnourished girl the reporter met in the forest is about to complete her degree in biotechnology at the University of North Carolina Greensboro. Doyle described how the Montagnard’s plight forced him to confront and cross a journalistic ethical point of no return that changed him forever. 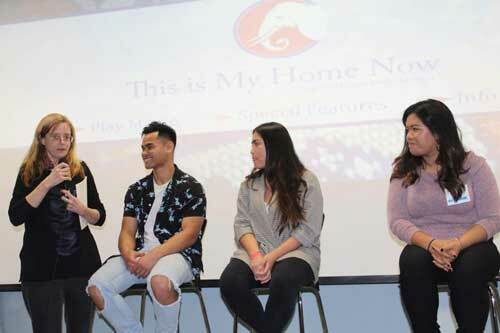 (L to R) Sara Colm, Philip Krongkon, Phun H, and Sun Bujri discuss the film, "This is my Home Now"
Many of the highlanders in attendance came to North Carolina as child refugees in the early 2000s. Today many are university students and see themselves as the last line of defense against losing what remains of their culture and language. After hearing about this strong desire to learn their language and preserve their culture Fainting Robin Foundation director Peter Maguire and distinguished scholar Sylvain Vogel traveled to Greensboro where they met with hilltribe elders and discussed Vogel returning to North Carolina to teach summer intensives on the hilltribe languages. They also met with officials at University of North Carolina’s Center For Southern History to discuss possible collaboration in the future. FRF’s first distinguished scholar, linguist Sylvain Vogel (see profile below) spent three weeks in the U.S. The Fainting Robin Foundation paid for his travel and all expenses while in the United States. In addition to the conference, Vogel delivered lectures at the UNCW French department, the Center For the Study of Southern History at UNC Chapel Hill and spoke informally at the Montagnard Association in Greensboro, Voice of America in Washington D.C., the Rotary Club of Wrightsville Beach, and to groups in Raleigh and Wilmington. 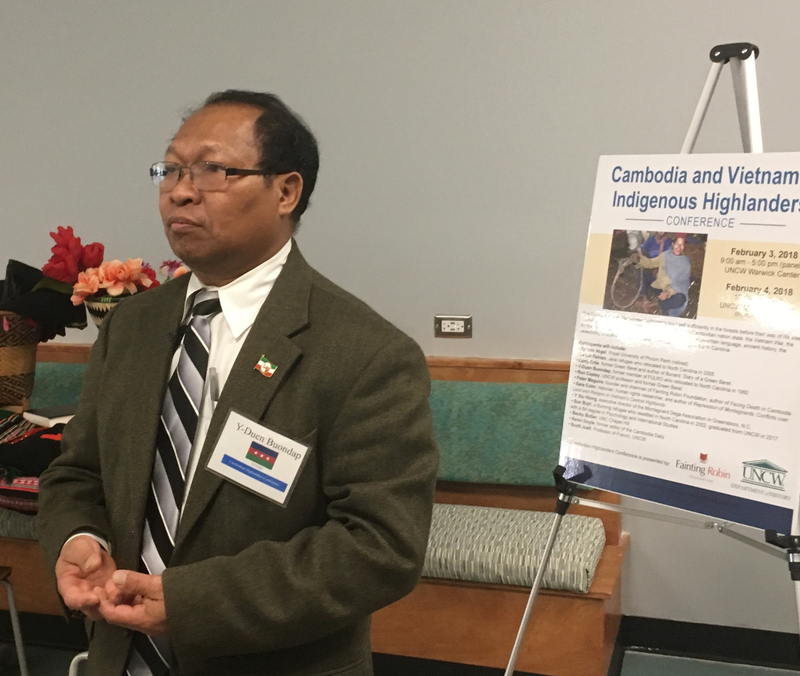 University of North Carolina Wilmington (UNCW) and Fainting Robin Foundation are hosting a two-day conference on the Highlanders of Cambodia and Vietnam in UNCW’s Warwick Center Feb. 3 and 4. These incredible people, known as Montagnards, fought alongside America during the Vietnam War and have since resettled in North Carolina as refugees. Throughout the conference, panels of experts will discuss this remarkable group’s unwritten language, history, the effects of the Vietnam War and their relocation to North Carolina. Conference panelists include former leaders of the United Front for the Liberation of Oppressed Races (FULRO); linguists Sylvain Vogel, Scott Juall and Becky Butler; former Green Berets Larry Crile and UNCW professor Ron Copley; human rights advocate Sara Colm; the former editor of Cambodia Daily Kevin Doyle; and many more. When: Saturday, February 3, 2018, 6-8 pm. Ticket Price: $25 per person, includes a Mexican dinner provided by Los Portales Taqueria, Wilmington's best Mexican restaurant, and one beer or glass of wine. Additional drinks will be available for purchase. You will be redirected to our secure DonorBox page to complete your transaction.